On Friday, March 24, Cugan drove me far away to a place about an hour away from Stevens Point, where March Haire Affaire was held. This may have been Wisconsin Rapids or Marshfield. We stayed, or “crashed,” at a house with a friendly couple, at least ten or twenty years older than us, with a dog or two, three or four cats that loved me, and pet hair all over the house, even on the towels. I decided to never have that many pets, because of all the hair. On the morning of the 25th, I parted my hair in the middle because that seemed more medieval. I hadn’t done this for several years, and liked doing it again so well that I began to part it in the middle for months afterward. Middle parts, which seemed to vanish in the 80s in the backlash against all things 70s and hippie, came back into fashion in the late 80s or early 90s. Nowadays, nobody cares where you part your hair. But when I had “hippie hair” in high school, one day I looked around and wondered why nobody else had a middle part. I felt terribly out of fashion, so I tried parting it differently. I didn’t have my own garb, so Cugan let me borrow some of his. I wore a white shirt and huge, green “horde” pants. Cugan tied the legs up with leather thongs, but I felt like I was drowning in the clothes, which were much too big for me and very hot. I may have worn my own black dress shoes. I laughed at the absurdity of this costume on me. Cugan gave me his cape to wear outside, since it was only March and still cold. We drove about an hour to the event, which was held in a school. We went into one large room full of merchants’ goods: veils, headdresses, clothing, jewelry, everything a person might need at a non-camping event. This spoiled me, because for a while I thought every event was like this, and that if I couldn’t afford something this time, I could get it the next. I found a green, embroidered dress which went over an off-white undertunic. Cugan said the color looked wonderful on me, and the woman selling the clothes said she could alter them if necessary. But the size was medium, and when I went into a bathroom and tried them on, they fit me perfectly. Some of the undertunic showed, but one of the women there told me it was supposed to, unlike a modern slip. This dress was much cooler and more comfortable. I went back into the merchant room and showed Cugan, who was amazed. He even told his fellow shire-mate Donato how amazing it was. I had no idea at the time that finding perfectly-fitting garb at your first event, and for only about $25, was highly unusual. Most events don’t have merchants selling full sets of garb. We then found a metal link chain that looked like gold, and this became my belt. (I tried wearing it as a necklace, but somebody told me only knights did that.) I think Cugan also lent me one of his leather pouches. Ayesha and her husband Donato were both there–and surprised to see me with Cugan. I don’t think Catherine came. Cevante also saw me, and hugged me with glee. I hoped she noticed I was there with Cugan. As a shy person surrounded by strangers, these familiar faces were welcome. I think Donato even offered us Coke in cans. He was selling yarn slipcovers for pop cans, which he made himself and (as I later discovered) he usually sold at events. They made your pop can look “period,” or like you belonged to the time period the SCA covered: about 600 to 1600 AD (the dates are subject to debate). Some of Cugan’s friends from outside the shire, such as from Appleton’s Windhaven, showed up. Cugan introduced me to them as his lady, and one of them, probably Clyde, said “Oh!” and kissed my hand. I must have smiled all day. I was never bored, and had lots of fun. At one point, Cugan and I went into the foyer and played pente at the tables set up there. I always thought this was a medieval game, but Wikipedia says it was invented in 1977. It’s sort of like checkers, except any number of people can play. Each player has a set of glass beads in a particular color; you move them around and capture other beads, on a cloth mat with a grid. Cugan and I played against another couple for a while. Cugan was red, and I think I was blue or green. I think we were all beginners. I won the most games, and was finally matched up against three guys from the other tables who also won most of their games. One of these was Clyde, who cracked lots of jokes as we played. One in particular I wish I could remember, because it became a catch phrase; I think it was a line from a song. One of the guys there seemed cocky, so I hoped he wouldn’t win. I came in second place at this game, making me nearly the pente champion. Because of this–coming in as a “newbie,” finding the perfect garb right off, nearly winning at pente, and stealing away Cugan’s heart–I told Brad in a letter that I felt like a cheekish, charmed upstart. –yet able to get around and weave beautiful patterns through touch. When Cugan and I crashed at his apartment once, John led me through the hallways. He was immensely capable. Unfortunately, he died young, in 2012. His obituary is up permanently, here. We sat at a table in the merchant room for a while, with Master John and a man dressed as an Arab. Once, Cugan turned his head down while talking, and John asked him why. Cugan, shocked, wondered how the heck John could have known he was looking down. It didn’t shock me, because I noticed in childhood how the sound of a person’s voice changes depending on how he turns his head and the proximity of a table. To Cugan, however, John seemed to see without eyes. Fighting–a bunch of guys and even a young woman in makeshift armor beating on each other with rattan sticks covered in duct tape–was in the gym, but I didn’t want to watch. That evening, we sat feast in the same room the merchants had used, which may have been a cafeteria. Along one side was a cardboard? castle for the kids to play in. There were several different “removes,” or courses, and the meat remove alone included at least two different kinds of already cold chicken. Cugan’s feast gear had strange-looking three-pronged forks. I loved eating off wooden plates and bowls and drinking from a wooden or pewter? goblet. I wasn’t too crazy about most of the food, except for the bread and the custard, which Master John loved. There was also a naming contest for the mascot, a winged-rabbit puppet. There were several winged stuffed animals, including cats, at one of the merchant tables; Cugan bought a few. Cugan won the contest with “Arfur of the Round Tail.” I think the “Round Tail” idea came from me. I thought it terribly corny, but he won, and got to keep the puppet, which he later dressed in its own garb. He also won or bought a stuffed rabbit, which I think he called Lancelot, and also dressed in its own garb. Winning Arfur made him very happy. A guy who liked stuffed animals? What a find! Outside at his car, I told Cugan he looked good in garb, which he did. 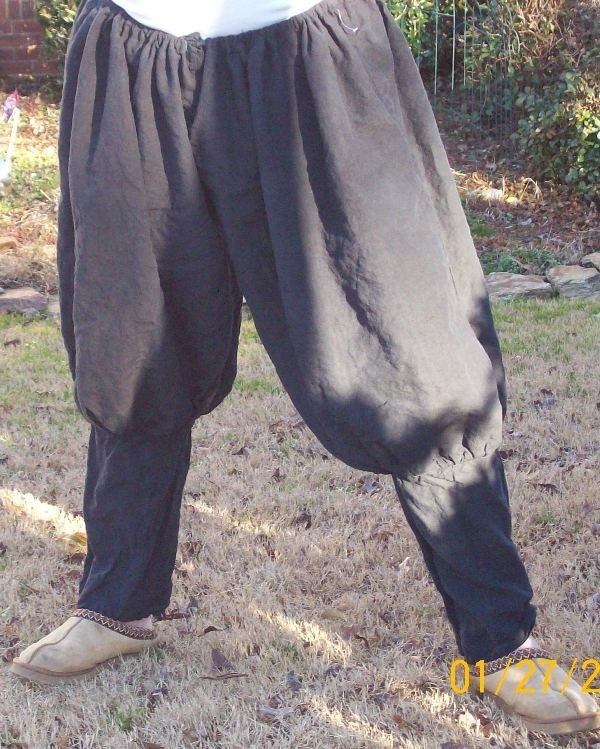 He wore a brown pirate shirt with huge, black “horde” pants, a black tunic-like vest tied with a belt, and black leather boots, which kept him from tripping in the pants. No one else was at the crash spot when we got back there, so we started to watch Dragonslayer in the living room. But Cugan was too tired. As long as we did watch, however, we still wore our garb. I didn’t want to change because my dress was comfortable, and it was fun to dress like I’d stepped out of the Middle Ages. In fact, years before I watched Dragonslayer and longed to wear those dresses.